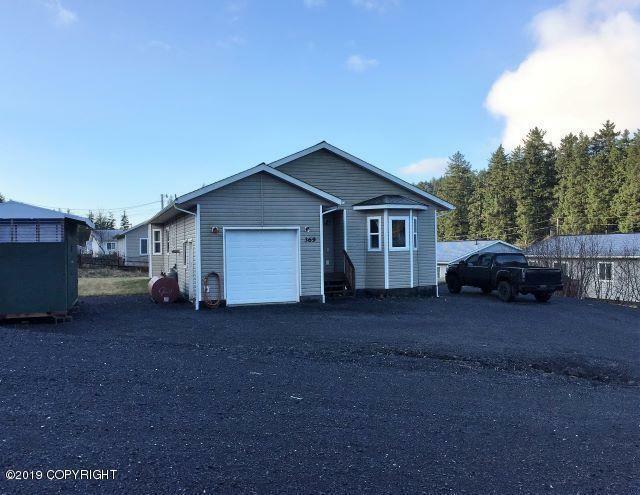 369 Augustine Court, Kodiak, AK.| MLS# 19-1371 | RE/MAX of Kodiak - Alaska Real Estate - "Honesty & Integrity...It's That Simple!" Looking for the perfect starter home? This 1,200+ SF newer, energy-efficient cottage-style home is located on a sunny cul-de-sac and is full of thoughtful details and features that set it apart from its competition. This home is perfect for a single, couple, or small family to make their own, and is in walking distance to wooded trails, lakes, grocery shopping, East Elementary and Kodiak College. The open kitchen/dining room, with a full bay window, corner built-ins, and upgraded cabinets is truly the heart of this sweet home, and contains room enough for a small, butcher block island, if desired. The living room, with its sliding glass door to the patio and large, level yard, is nestled in the middle of the home for privacy and coziness. The master bedroom has another full bay window that captures much-needed morning sun. A hallway flanked by separate closets leads you to a spacious master bath with a deep, jetted tub and plenty of natural light. The second bedroom contains ample closet space and a bright, 3/4 bath is just across the hall. A walk-in pantry/laundry room with floor to ceiling shelves is located conveniently between the single garage and kitchen. The garage has extra high storage, and the property comes with an 8'x16' wood storage shed. There is plenty of gravel parking across the entire front of the property and and the remainder of the lot is flat, level lawn. Call your REALTOR to see it today!